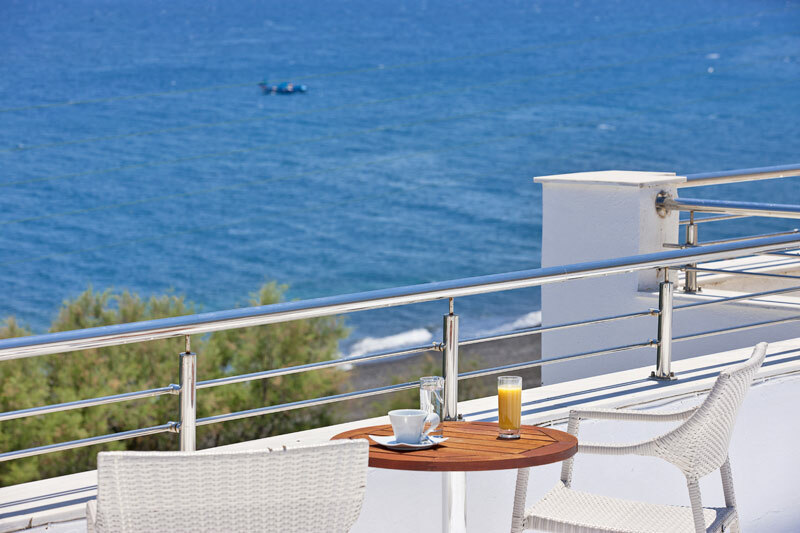 Alesahne Beach Hotel is a charming hotel situated at Kamari, Santorini Island. It offers smartly decorated classic and superior rooms to rent, in a cosy and relaxing environment with friendly and caring staff. Lying right on Kamari beach, one of the renowned black-pebbled beaches on Santorini Island, Alesahne Beach Hotel can certainly become the place to be, in Kamari. It promises you an unforgettable vacation in Santorini, Greece. Classic Room: Bedroom, bathroom, with shower and private veranda. Classic Room with Sea View: Bedroom, bathroom with shower and private veranda with views to Kamari Beach and Sea. Superior Room: Bedroom, sitting area with sofa, bathroom with shower and private veranda. Superior Room with Sea View: Bedroom, sitting area with sofa, bathroom with shower and private veranda with views to Kamari Beach and the Sea. Alesahne Room with Shared Pool: Bedroom and bathroom with shower, private sun beds and sitting area on the Palm Patio with Pool, shared only by four rooms.